This was my second trip to New England Dragway in Epping, NH. Several hundred cars there, and a lot more highly modified dragsters than the first trip. I saw cars with chutes, and many that made you want to cover your ears. There were 11 second times all over the place, whereas the first time I only saw a few 11's. The most outrageous was a Buick station wagon with wire rims and a car seat in the back that ran low 11's. This guy had a full Grand National drive train and engine in the thing. Awsome. Track is about sea level and weather was dry and around 50 degrees. 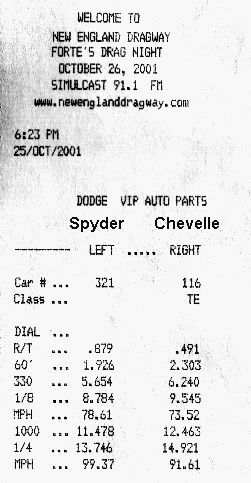 My first trip to the dragstrip back in August netted a best of 14.387 at 97.33 mph. This was bone stock. I really wanted into the 13's. Since the first trip I have added a K&N air filter, and everything else was stock. Best time was a 13.76 at 99.37 MPH. I'm easily into the 13's!!!!! I was thrilled with this time as my goal was to break into the 13's. I attribute the better time to the K&N which let the car breath better, and the nice, cool air. As you can see, I gained half of my improvement in the first 60 feet, and kept on improving. 2 MPH higher trap speed was good, but 100 MPH would have been nice. I think maybe replacing the BOV with a Greddy might hold a bit more boost and get me over the edge. Overall another very fun night of drag racing, although I didn't see any other 3Si's. Talked with a cool guy in an eclipse who was boosting to 21 PSI and running 13's, too.